San Juan Regional Medical Center is a locally owned and governed, not-for-profit hospital with strong ties to the community. The history of the hospital began in 1910 when two local physicians started the small, 8-bed facility, and was incorporated in 1952 as a not-for-profit. Today, SJRMC is a regional full-service, Level III – 240 bed acute care hospital serving Farmington, New Mexico and San Juan County and providing specialized medical service to the Four Corners area of Arizona, Colorado, New Mexico and Utah. Offering the most comprehensive range of inpatient and outpatient health care services within the Four Corners region, uniqueness is at the core of the Mission, Vision and Philosophy of SJRMC with the primary goal being to personalize health care and create enthusiasm and vitality in healing. The differences in each person, regardless of their culture, background or disease will be honored at SJRMC in order to go beyond tolerance and respect towards a sense of personal reverence. 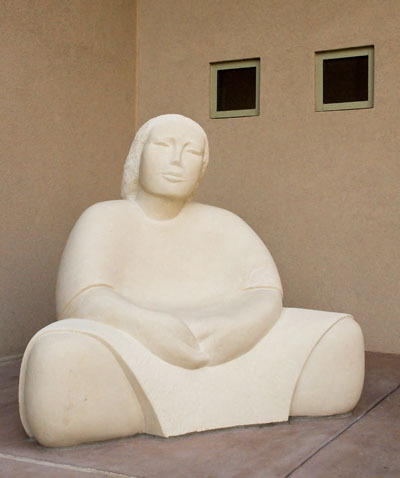 The LSC would like the artwork to highlight the culture of the Four Corners region; and to symbolize the connection between mind and body, art and science, and caregiver and patient, in an innovative healing environment. The LSC is also interested in having the artwork function as a way finding device within the grounds of the hospital and to express a sense of discovery, innovation and connectedness. Madeline Wiener was selected to create the artwork, which was installed in May 2010. Primarily a stone carver with a self-described power tool infatuation, Wiener maintains a studio in downtown Denver and has been creating public sculpture since 1991. Her work is located throughout the U.S. and abroad. She studied at the School of Visual Arts in New York and is the founder and director of the Marble Institute of Colorado, a non-profit organization that sponsors the annual MARBLE/marble Symposium.